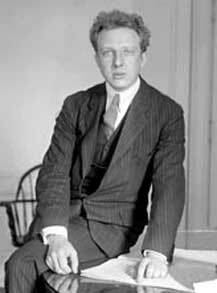 On Monday, 22 October 1917, Leopold Stokowski and the Philadelphia Orchestra boarded a ferryboat taking them from Philadelphia, across the Delaware river to Camden, New Jersey. Camden the home of the Victor Talking Machine Company, the leader in recording music in that era. The Victor Company had asked Stokowski to record as early as 1915 3. Although these Monday first recording sessions were not successful, the Orchestra returned to Camden on Wednesday, October 24 to produce its first two released phonograph recordings. With there first 1917 recordings, Stokowski and the Philadelphia Orchestra began an historic collaboration which which lasted through 1940. This portion of the Leopold Stokowski site is devoted to the earliest recordings of Leopold Stokowski which he made with the Philadelphia Orchestra. These pioneering recordings were made with the acoustic recording process between 1917 and 1924. Then, beginning in 1925, Stokowski and the Philadelphia Orchestra entered a new era when they were the first symphony orchestra in the world to make recordings with the new electrical process. This was the Westrex Electrical Recording System developed by Bell Laboratories, as described in the page 1925 - First Electrical Recording of Stokowski - Philadelphia Orchestra. 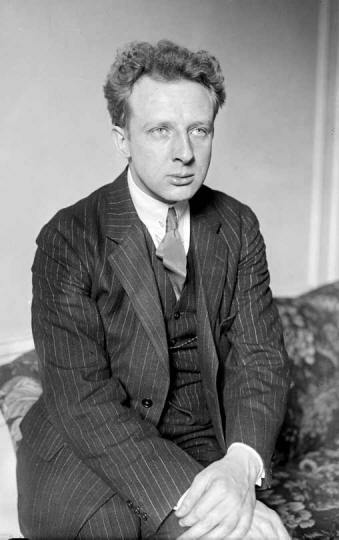 This pioneering story of the acoustic recordings of Leopold Stokowski and the Philadelphia Orchestra is described in seven different pages of this site, shown in the links below. Each page offers descriptions of the acoustic recording sessions of Leopold Stokowski and the Philadelphia Orchestra, and the records issued on Victor Red Seal disks, from 1917 through to the end of acoustic recordings by Victor in late 1924. Stokowski and the Philadelphia Orchestra worked intensively to record these acoustic disks at a time when the technology required uncomfortable recording conditions, and produced variable sound and results even with the most able technicians. Even taking great care, the recorded results were often difficult to predict. Also, Stokowski would need to wait, sometimes weeks to hear the recording results, since playing a wax master just after recording would have destroyed the master. As a result of these significant difficulties, and because of Stokowski's high standards, few of the recording made were approved for release by Stokowski. Edward Johnson, the eminent Stokowski scholar states in his notes to the CALA CD Stokowski First Releases, "
...Between 1917 and 1924, they made an estimated 450 acoustic recordings, but the old method of playing into a large horn gave a very poor representation of orchestral sound, and of all their acoustic discs, only 60 or so were actually issued..." 1. In the page Leopold Stokowski Chronological Discography of Acoustic Recordings 1917 to 1924, I count only 69 acoustic sides released by Stokowski. This count increases to 71 sides if the two sides of the first movement of the 1924 Rachmaninoff Piano Concerto no 2, not then released, but now available are included. This 16% yield during the acoustic period indicates the difficulty faced by Stokowski and a limited number of musicians, cramped together in front of the recording horn with little comfort or ventilation, seeking to capture a musical performance. Another limitation associated with the acoustic process was the limited range of frequencies which it could reproduce. 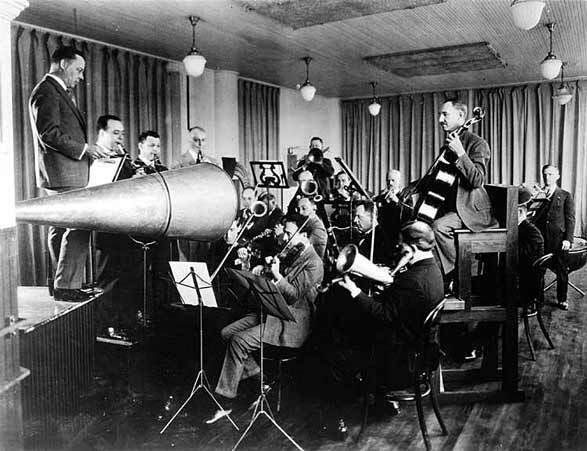 Even under the best conditions by 1917, the acoustic system was still restricted to a narrow band of frequencies, about 250 Hertz to about 2,500 Hertz. And even this range was achieved only by the best operators and equipment, and with the wax masters then carefully processed. This was effectively a range of about the E or F below middle C, or about 190 Hz to about three octaves above middle C, which is about 2,100 Hz 1. Stokowski and the Philadelphians would have to wait until 1925 for the electrical recording process to arrive, able reproduce music up to about 6,000 hertz - another octave of reproduction. This extra octave not only reproduced higher instruments, but also provided reduced harmonic distortion and increased transparency of the electrical recording process. There are a pair of famous photographs showing the Victor Camden studio in Building 15 with an acoustic configuration, and the same scene with the recording configuration for the Western Electric Westrex electrical equipment. This photograph includes the Western Electric 1B microphone of the first electrical recording system. The Westrex electrical configuration is shown in the web page devoted to the 1925 - Stokowski Other Philadelphia Orchestra Electrical Recordings. The acoustic recording configuration is shown in the photograph below. From other photographs, it appears that the acoustic sessions of earlier years were even more cramped than in this photography. Note the musicians on various risers, and the "Stroh" violins which have small horns attached to project the sound toward the acoustic recording horn. The conductor here is perhaps Rosario Bourdon, the artistic director of the Victor Talking Machine Company conducting the Victor Orchestra. In addition to the difficulties for the musicians, the recording engineers had a challenging task which took trial and error experience to produce better recordings. For example, in the disk cutting chamber in the recording room, heat from incandescent bulbs were typically used to keep the wax master disks warm on the cutting turntable. The temperature of the wax master influenced the surface noise of the groove when cut. Similarly, at the end of the recording horn, sound boxes were used with a diaphragm made of various materials that were selected to be non-resonant, such as mica. The diaphragm was linked to the recording horn by rubber connectors, and the thickness of the diaphragm and the consistency of the rubber connector were each selected by the recording engineer to achieve the best result, again, by trial and error. To read more about the development the Victor Talking Machine Company and of the acoustic method of recording, click here . These pages also contain .mp3 coded reproductions of each of the Stokowski Victor acoustic recordings being described. As primitive as these recordings may on certain occasions be, the reproductions here are intended to permit Stokowski fans to listen to these historic Stokowski recordings prior to purchasing one of the modern CD transcriptions of classic 78 RPM Stokowski performances. In the case of the Stokowski acoustic recordings, an excellent source of amazingly effective restorations of these performances may be found at Pristine Classical. Transfers of these often rare acoustic recordings were made by Edward Johnson from his collection. Andrew Rose, with his magic (or so it seems to me) technology has stabilized and refurbished these acoustic recordings. Two volumes of these restorations are available so far. Visit the Pristine Classical site to download these recordings. In addition, there are a number of pages of information related to the recordings of Leopold Stokowski and his recordings on this site. Since there seems to be a surprising lack of historical information about the principal musicians of the Philadelphia Orchestra, and in general the principals of the other leading symphony orchestras of the United States, I have started to try to compile brief biographies of the musicians of the major orchestras listed below. 1 Johnson, Edward. Notes to 'Stokowski First Releases'. CALA Records CACD502. London. 1995.